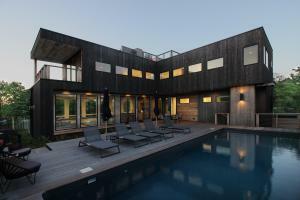 TELFORD, PENNSYLVANIA, UNITED STATES, November 20, 2018 /EINPresswire.com/ — Located in Seaview and designed by Brooklyn-based architect PAUL, Fire Island, this 4-bedroom seasonal home is placed on the site to take advantage of the sun, wind and views of both ocean and bay. The square site required a precise arrangement of the house and pool, that allowed the house to wrap the deck and pool, forming a barrier from the public walk. The “L” shape of the house creates a private enclave of exterior space to celebrate the cherished indoor|outdoor experience of Fire Island. A modest roof deck allows for unobstructed sunset and sunrise views. 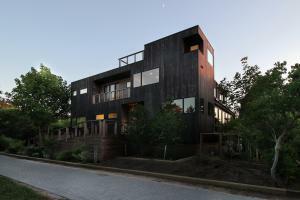 Clad primarily in reSAWN’s UNAGI and TAKEI shou sugi ban charred Accoya, cuts, voids and punches are composed with windows, recesses and overhangs for seemingly unorganized facades. 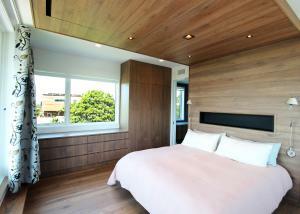 The first floor of the house incorporates reSAWN’s LONGPORT black walnut as ceiling cladding, and then includes LONGPORT as flooring and wall cladding on the second floor. LONGPORT by reSAWN TIMBER co. features wide plank plain sawn select or character grade American Black WALNUT prefinished with a matte polyurethane for flooring or wall cladding. The wide face width showcases the full character and grain pattern that black walnut has to offer. American Black Walnut is a heavy, strong wood defined by its rich deep browns and beautiful figure. The grain pattern of black walnut is mostly straight and open, but some boards have burled or curly grain. UNAGI and TAKEI by reSAWN TIMBER co. feature CHARRED Accoya® wood burnt in the Japanese style of shou sugi ban. Accoya® wood is the result of decades of research and development that has brought together a long-established, extensively proven wood modification technique and leading-edge patented technology – acetylation to create a high performance wood, ideal for outdoor use and challenging applications. PAUL was established in New York City in 2014 after working for nearly 20 years under the direction of award winning architectural practices in both New York City and Philadelphia. While practicing in Philadelphia, Paul learned the process of crafting large contemporary projects with development teams. While practicing in New York, Paul learned the process of crafting contemporary custom residential spaces for private clients. The combination of experiences yields a passion for good design and the belief that well-crafted buildings improve quality of life.